Will New York City Ever Be the Same Again? After getting to know, or in many cases re-know, each other the NASCAR Touring Series champions started to live it up big in New York City this week with a few specials events. As the clock ticked towards Friday night’s lavish NASCAR Nextel Cup Series banquet, the Touring titlists let their hair down in the Big Apple. competitors, media members and VIPs by giving a brief overview of how NASCAR’s regional tours are doing. He said that NASCAR CEO Brian France had labeled the touring office as NASCAR’s “Division of Chance and Change” and explained why that was a very good thing. The champs were all awarded a wearable trophy of sorts. Each driver received a new personalized Bell Helmet in reward for their title. One helmet in particular soon became the center of attention. NASCAR Nextel Cup champion Tony Stewart left his hardware behind when he had another function to attend. After he left, the Touring class decide to personalize the helmet box with their autographs, personal messages and more. It came as little surprise that Southwest champion Jim Pettit was one of the ringleaders. “Come run with the big dogs when you can,” wrote Southeast Series champion Jeff Fultz. A few of the ladies in the group decided that there was something even better than an autograph to give Stewart, so they put on their lipstick and left several smooches for the now two-time Cup champ. When they were finished, the box was plastered with pink and red kisses. 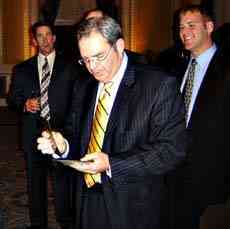 “Wow!” said SPEED Channel & Speed51.com’s Bob Dillner after spying a sultry souvenir on the cardboard box. “Whose lipstick is that?” The answer was Veronica Pettit - Jim's wife. NASCAR still had another reward for the drivers. Each champion was given $100 in cash and a $100 traveler’s check to use for sightseeing on their stay in New York. “You can buy four Rolex watches with this,” joked Busch North champion Andy Santerre in reference to the number of street vendors in town who sell watches of questionable origins. When there was one more envelope than there were champions, Dodge Weekly Racing Series National champion Peyton Sellers lobbied for something extra for his first trip to Champions Week. The champs assemble for their group photo. 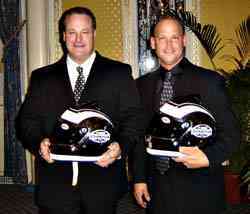 As a prelude to the big ball, all 12 NASCAR champions for 2005 were honored at a Champions dinner on Thursday night. It was a far cry from the stereotypical rubber chicken banquet that many race series and tracks have every year. For starters, it was held in the Empire Room of New York City’s Waldorf-Astoria Hotel. It wasn’t just any room. The former lounge once hosted Frank Sinatra and Dinah Shore as they moved up to become stars. This time, the stars were all of the racing variety. The evening had moments that were both serious and moments that were anything but that. Hawk was moved by Sellers’ request enough to consider giving each champion $2,500 in mad money, but thought better of it once he thought about what the NASCAR bean counters might think of that. After a few hours of sleep and recovery time, everyone was back in the limelight at the annual Myers Brother Breakfast presented by Sunoco on Friday morning. Well, most everyone made. NASCAR Midwest champ Justin Diercks had a migraine and was a no-show, and come to think about it, Bob Dillner was nowhere to be seen either. Anyways, all of the touring top guns were recognized in front of a crowded room of movers and shakers, which included members of the national media, corporate bigwigs and a few Nextel Cup drivers. And as the week moves along, those champions are certainly proving themselves grateful for the honor. We’ll have more on their adventures in New York coming soon. Justin Diercks (L) and Jeff Fultz (R) vandalize the box of Tony Stewart's new Champions helmet. They weren't the only ones who did so either! Don Hawk hands out money as Peyton Sellers looks on with interest.